Gymnastics bars, rock climbing wall, trampoline, bounce house, foam pit, tunnels, swings and more in our outstanding kid's gym! There's so much to do, we hope your children will try something new each time they come to this unstructured all ages play time. Looking for a safe, wholesome and fun place for your 7-12 year old to "hang out" with friends? Rolly Pollies in East Amherst is the place! Who says swinging, rolling and spinning are only for the gym? Join us for Rolly Pollies Art Classes as we explore our artistic side in a whole new way! SN@P stands for Special Needs @ Play, an open play time dedicated to children with special needs and their families. Inspired by the TV show "American Ninja Warrior", children will participate in exciting obstacles including quad steps, spider walk, cargo net or rings, trampoline, wall climbs, barrel swing and more! 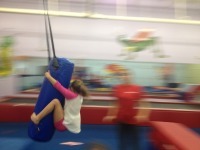 Our Ninja Warrior Parties build courage as we test children's limits with physical feats that are both challenging and fun. Come experience the joy of making music! Music Adventures is a child-centered, age-appropriate program that allows children to actively participate in the art of making music with small class sizes. A carefully sequenced curriculum introduces children to a wide variety of musical sounds, styles, and tonalities in a fun and engaging class environment. At Rolly Pollies we host one party at a time... yours! All parties are closed to the public so we may offer you a unique and special experience! This is not a "Where are my guests?" "Where is my child?' type of party place. Your child and their guests are engaged and playing together the entire party...not just at cake time! All parties welcome adults to accompany children at no cost! Every party is run by 2-3 professional and experienced Rolly Pollies teachers. Children are supervised, engaged and entertained by our highly trained and organized staff. Our parties include the zipline, everytime!